Accessories... the brickforge shields are gray and so are the bows next to the two tan and then one dark tan bow. Lots of black helmets, plumes, gray crossbows, pith helmets, and alot more random stuff. I'd like to sell and get Pay Pal funds. I've got good feedback on here. Private message has been sent. 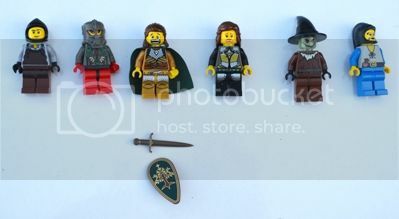 Some more stuff addes, make cash offers or trades..... will take new Dragon Knights, new Brown bear, Warg, brown pants, Highlander shield, new Lego longsword any color, Brick arm Weapons like AK, M4, Galaxy Patrol Collectable Mini, lemme know what you want and what you got.